I intend to use Martin Bylica’s career as a window into the courtly and political world of Renaissance Hungary. In his roles as court astrologer, political advisor, university professor, and emissary Bylica maintained wide network of important patrons and colleagues both inside and outside Hungary. Existing scholarship has established the chronology of Bylica’s life and has indicated his relationships to other important Renaissance scholars, such as the Cardinal Pietro Barbo (later Pope Paul II), the brilliant German astronomer Regiomontanus, the Viennese instrument maker Hans Dorn, the humanists Janus Pannonius and Johannes Vitez, and the Hungarian king Matthias Corvinus. The questions that have motivated previous scholars, however, focus on elucidating the context for Nicholas Copernicus’s intellectual development. Consequently, Bylica’s career is examined less for what it reveals about his own context than for how it contributed to Copernicus’s achievement. My project addresses two lacunae in the historical scholarship: What was the content of Bylica’s work? And what was the context for that work? 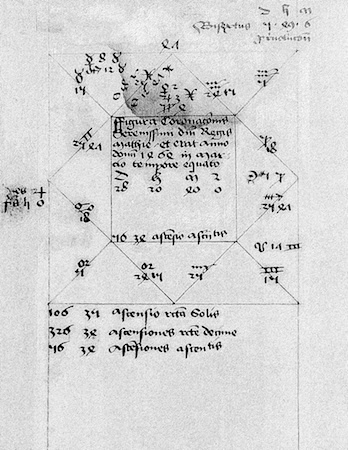 By concentrating on the content of Bylica’s texts, I intend to reconstruct his understanding of the practice of astrology, including its techniques, canons, and goals. At the same time, this focus on Bylica’s texts will reveal the people and events that stood at the center of his astrological efforts. Constructing a prosopography of these people and events will, in turn, help me recover the people for whom he was practicing that astrology and in what contexts.